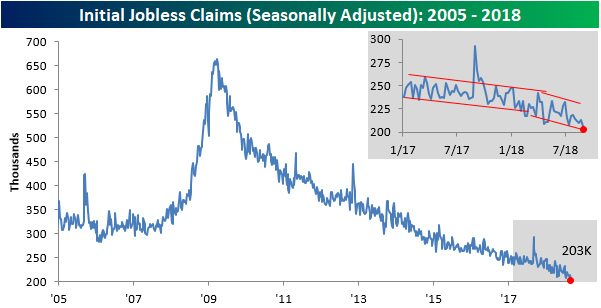 Like an aging hippie that just can’t get with the times, weekly jobless claims remain at levels not seen since the 1960s. This week’s report came in at 204K versus estimates for a reading of 210K and was the lowest weekly print since December 1969. Pretty soon we’re going to have to adjust the Y-axis lower! 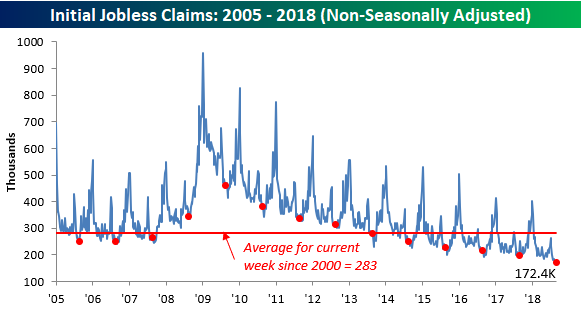 Weekly claims have now been at or below 300K for a record 184 straight weeks, at or below 250K for 49 straight weeks (longest streak since January 1970), and at or below 225K for ten straight weeks (longest streak since 1969). 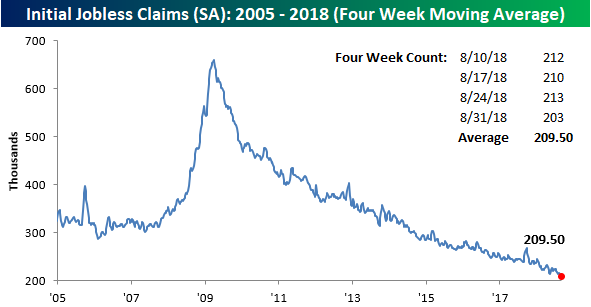 This week’s generational low in weekly claims also dragged the four-week moving average lower by 2K, from 210K down to 208K. That’s also the lowest reading for this indicator since December 1969. On a non-seasonally adjusted basis (NSA), claims dropped over 10K, falling from 172.4K down to 161.9K. For the current week of the year, that’s the lowest reading since 1969 and it’s more than 125K below the average of 289K for the current week of the year dating back to 2000.